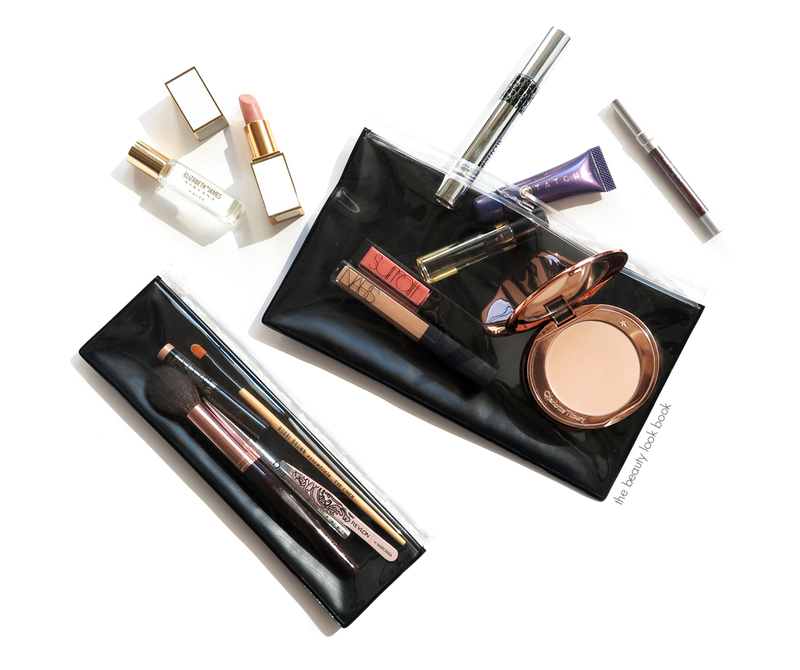 I’ve received lots of requests about clear makeup bags ever since I featured a clear Bobbi Brown cosmetic bag in a few of my inside my bag posts. Unfortunately it was a gift with purchase a few years ago and was never released for purchase which is too bad because it was well made and compact enough to fit into most of my smaller purses. I’ve been on the hunt for something similar but haven’t found anything quite like it. The Truffle Clarity Clutches are a favorite for their sleek look, high quality material and functional design but some have asked for other recommendations. I spotted these new MAC Clear Bag Sets ($25) and immediately went to my MAC counter to investigate. Size dimensions weren’t disclosed online so I wasn’t sure how small or large these were. They are both fairly compact in size. 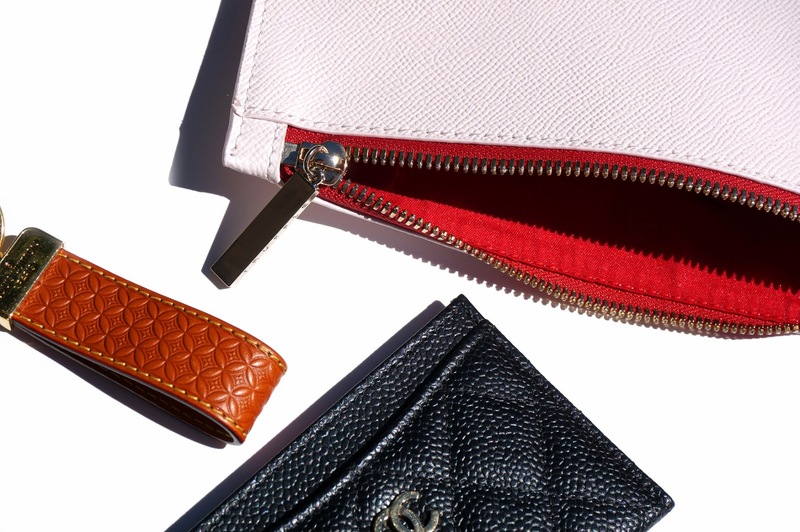 The flat design makes them fit easily into your purse and keep everything compact. The material is just ok. It’s nicely made but not the best quality. It’s not as good as the material used on my Bobbi Brown case or Truffle Pouch. The design of the MAC Clear Bag Set is basic and simple with a no-fuss look, but it lacks a hard backing and the trim is very minimal around the edges which makes it easy to bend. I had one corner folded (accidentally) after putting it inside my purse. It didn’t crease completely, but it did get mashed up a bit. The bag isn’t ruined and it will probably go back to its original shape if I lay it flat for a short while. I find these functional but in the past I have had issues with other brands of pouches and bags that have the plastic zipper seal – I’ve found they aren’t always the sturdiest and often become misaligned and the pouches stop sealing all together. Only time will tell with these, but so far they do seem to be pretty well made. I’ve used these for a couple of weeks and they have held up pretty well although they aren’t the sturdiest makeup bags I’ve tried so I don’t know how long they will hold up. I like that the design is simple and sleek. They keep everything compact and having one clear side is nice so you don’t have to go digging through your makeup bag to find things. The simplicity in the design has a slight downside in the sense the trim is almost non-exisiting so it is very easy to bend. With thinner plastic material I do sometimes worry about it stretching if things don’t stay flat inside making the shape distorted. Overall I think they are nice. I wouldn’t call them must-haves simply because I would have preferred something with a sturdier design. Still, they are functional and I find the price is reasonable for a set of two pouches. These would certainly be a good storage option for brushes if you are looking for something to store them on-the-go. I purchased the MAC Clear Bag Set for $25 from Nordstrom. It’s also available at Macy’s and Maccosmetics.com. 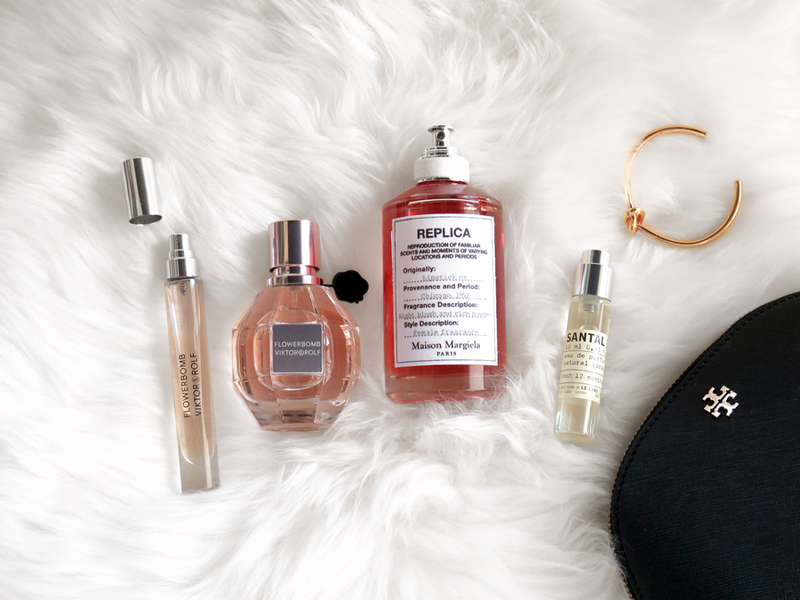 Do you have a favorite clear makeup bag? For size reference on the two kinds of Truffle clutches I own, the Small Clarity Clutches measure 7 1/2” H X 9 1/2” W. They are similar in size to the Privacy Clutches. Both styles come in four different colors White, Blush, Seaglass and Dove Grey. I can fit more items into the clear version, with the solid leather clutch, I need to stack things well otherwise they bulk up the pouch. The construction of the Privacy Clutches are well made. The leather is sturdy, interior is nicely lined, zipper is also well constructed. When I told my husband I spent $40+ on the Clear Clutch, he said, “you spent what on a clear pouch?” but when he saw the actual product he was very impressed with the quality and design. He also approves of the Privacy version as well. Contents featured above all inside the pouch (minus the jewelry). Bottom line love. 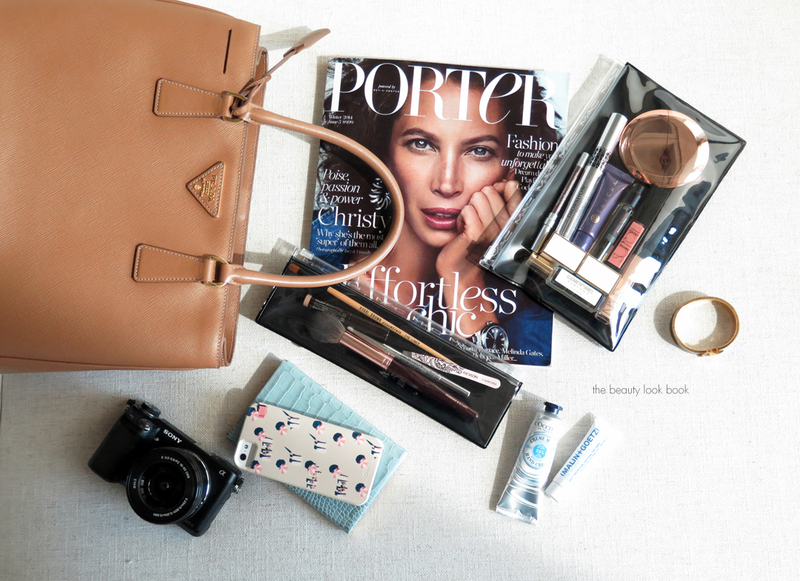 The Privacy Clutch is functional as a makeup bag yet sleek enough to use as a stand alone clutch. At $52 I do find them on the pricey side for something simple, but those who own a Truffle Clutch or Pouch know that once you have one, you absolutely love it. The products from the line are sleek, classic and well made. The Privacy Clutches retail for $54 each at Onetruffle.com. There are currently four color options. If you’re interested in other designs, they offer a variety of shapes, sizes and colors to choose from. Do you own any Truffle pouches or clutches? What’s your favorite? Update: for Labor Day, Truffle is offering free US shipping on order with code LABORDAY. The Privacy Clutch was gifted by Truffle. The Clarity Clutch in Grey was purchased by me. For more information, refer to my Disclosures. come pretty close but with a different design twist which I love. Truffle carries a number of different flat pouches that range in size, design, color and shape. I was particularly smitten with the shape and size of the Small Clarity Clutch ($42). It measures 7 1/2” tall X 9 1/2” wide and is designed with a luxe textured leather trim and gold plated hardware, and it’s size is TSA approved making it the perfect companion for any carry-on. Truffle kindly sent a white one for review, I loved it so much I bought another one in grey. 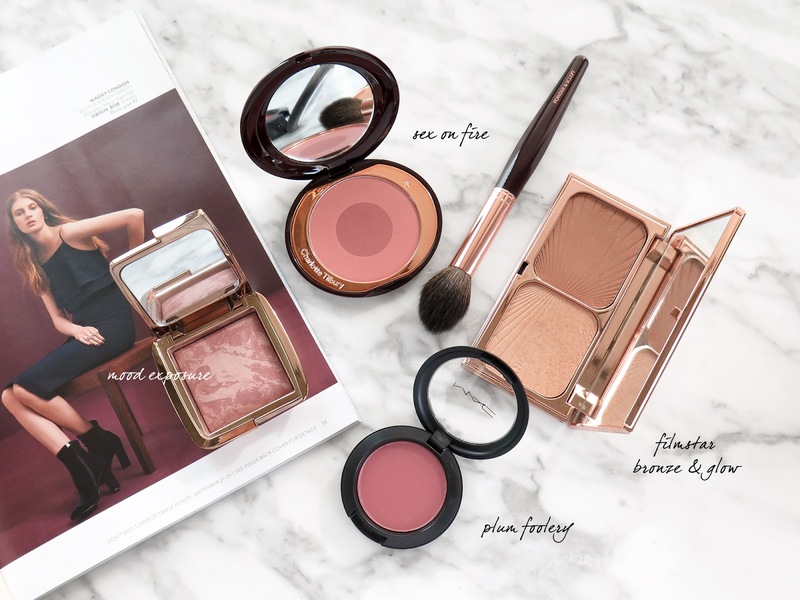 The small Clarity Clutches are compact enough to fit the essentials for makeup: compact, mini hand cream, lipgloss, eyeshadow stick, eyeliner, mini perfume and a lipstick. The plastic case is well made so it’s thick and sturdy yet flexible. The leather trim is well designed, it has a textured surface that is also extremely sturdy and holds the shape of the bag well. I’ve found these really good for organizing accessories and makeup. The small size helps me keep a well edited makeup bag. Those who have seen past Inside My Bag posts know I tend to have an overpacked makeup bag (even on the go). These are also great for the pool or beach to carry a few things with you. The clear pouch makes it easy to find things in your bag. Below is the Small White Clarity Clutch with beach and pool essentials tucked inside. For the beach the larger size would be more ideal to carry larger sunscreens, hair ties, a small comb etc. Overall a huge thumbs up. Even though the $42 price tag seems a bit steep for a small makeup bag, they are extremely well made clutches – the quality is definitely there in the material and design. The leather is thick and sturdy and the hardware is also very good. You can find out more about Truffle on their website www.onetruffle.com. Also follow them on Facebook, Twitter and Instagram for new on the latest releases, occasional promo codes and Truffle inspiration. There are a number of different pouch and clutch options to suit your personal taste. I’d love to hear what your favorite makeup bags are. Do you have any favorites that are clear? One clutch courtesy of Truffle for review consideration, the other clutch was purchased by me. For more information see my Disclosures.